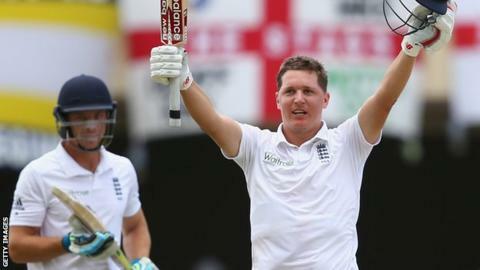 Gary Ballance's century and a stunning Chris Jordan catch set up England's victory push in the first Test against West Indies in Antigua. Ballance hit 122, Joe Root 59 and Jos Buttler a rapid unbeaten 59 to help the tourists declare on 333-7. Chasing a notional 438 to win, West Indies lost Darren Bravo for 32 late on as they closed day four on 98-2. The obdurate Devon Smith, who added 83 with Bravo for the second wicket, will resume on 59. "The bowlers have to do it collectively. You need to swap the bowlers around, try some funny field placings, and not too many boundary fielders unless you're going to bowl for the hook. They'll need to make the West Indian batsmen play shots because, if they keep blocking, it's very difficult to prise them out." Ballance said England were "pretty happy" with their position as they chase a first win in 10 Tests away from home. But Smith demonstrated enough application in conditions that continue to favour the batsmen to suggest England can expect a challenging final day. There was minimal lateral movement for the seamers in the 40 overs possible after they declared shortly before tea. The first wicket owed much to extra bounce from Stuart Broad as Kraigg Brathwaite fended to short leg in the second over, and England were thankful for Jordan's reactions and athleticism to end Bravo's resistance six overs from the close. Driving at the part-time off-spin of Root, Bravo edged to slip, where Jordan dived to his right to cling on almost after the ball had passed him. Ballance's hundred - the 25-year-old's fourth in nine Tests and his first overseas - was central to England adding 217 in 48 overs after they resumed on 116-3. Compact and organised, he drove purposefully through the off side and rotated the strike well with Root as they extended their fourth-wicket partnership, worth 64 overnight, to 114. Root, whose 83 was central to England's recovery in the first innings, had made 59 when he played on for the second time in the match as he defended Jason Holder off the back foot. "I don't know how you judge the best catch of all time, but I do know that catch from Chris Jordan was right up there." Ben Stokes's brisk 35 added impetus, although he perished in the first over after lunch giving the otherwise ineffective Sulieman Benn the charge. Ballance, who went to three figures with a meaty drive down the ground, lifted Benn for six over long-on to take England's lead beyond 400, only to swing the same bowler to Jermaine Blackwood at deep mid-wicket. The free-scoring Buttler continued to prosper as West Indies' motivation faded, adding 52 in 28 balls with Jordan before the latter's departure prompted the declaration. Listen to Geoffrey Boycott and Jonathan Agnew review the fourth day's play on the Test Match Special podcast. Read more on What has happened to West Indies cricket?